After starting to read two other possible books, I changed my mind and waited until Russian Roulette, was released. If I am to be honest, I hoped to read the nail in the coffin that would put this whole Russia investigation six feet under. I was hungry for conclusive details, even to finding out what was in the letter in the lacquered box given as a gift to Trump by Putin at the Miss Universe Pageant. 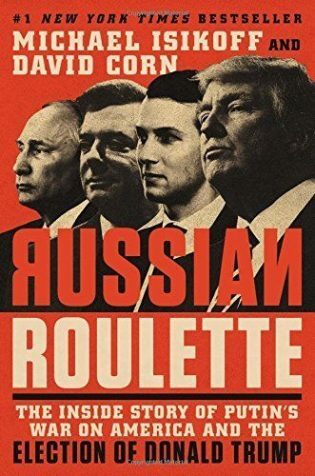 I must admit, there were some intriguing facts presented, but overall there is no foolproof evidence of Putin’s involvement in the election or his motives in this book. There was no answer to the letter mystery either. In the last two pages of the book, they say, “there was still much about Putin’s cyberattacks that was cloaked in mystery, especially what had happened in Russia.” It is a challenging task to present data when the evaluation of the data has not yet been completed. I appreciated the authors’ attention to detail. It is chronological. In effect, it is an election diary. Much we know already from the plethora of media coverage, but it is really shocking to go back and take it in again in small fact-filled bites. One can hardly imagine they are talking about our United States. Isikoff is an investigative reporter for Yahoo News. Corn is the Washington bureau chief of Mother Jones. Together they also wrote Hubris: The Inside story of Spin, Scandal, and the Selling of the Iraq War, 2006. They write a careful, piece-by-piece look at the business dealings between Russian and various tentacles of Trump’s shady business empire, including attempted spinoffs from the Miss Universe pageant in Moscow. Perhaps this opportunistic man just couldn’t criticize the despot whose permission he would need to build a Trump Tower in Moscow. You might expect this book to be partisan. It is not. Both parties will groan at the depiction of their actions. Isikoff and Corn present both campaigns in an unfavorable light. For aggrieved Clinton supporters, reading Russian Roulette will be like reliving a nightmare. Trump supporters, too, should wince at the cringe-worthy embarrassments that would have derailed any other candidate. For the first time, you read of Ivanka’s face reddening and eyes filling with tears after seeing the “Access Hollywood” tape, begging her father to apologize. He did not. His explanation, “locker room talk.” The news of the National Intelligence Administration and Homeland Security statement saying the intelligence community was, “confident that the Russian Government directed the hacking of the Democratic National Committee’s email system, consistent with the methods and motivations of Russian-directed efforts,” and the airing of the Access Hollywood tape hit on the same day. Trying to shift the focus, the Clinton staffers hit the phones, calling reporters they had worked with, urging them to give more attention to the Russia Story. As we all know, the Access Hollywood tape won out. All this and the still-to-come dumping of the Podesta emails happened on October 7th. That day may prove to be a real turning point in American history. Coincidentally, it was Vladimir Putin’s 64th birthday. Much attention in Russian Roulette is paid to James B. Comey’s impact. Isikoff and Corn remind us that Democrat Harry Reid, courageously attacked Comey for his double standard. Comey would not permit information about the Russian investigation to be communicated publically, but had no similar compunctions regarding Clinton’s email investigation. His last minute announcement of Clinton’s email investigation being reopened so close to the election may very well have changed the results. In fact, historians may long debate who had a bigger influence on the outcome: our previous FBI director or Vladimir Putin. I look forward to reading his new book, A Higher Loyalty, when it is released to get his side of the story. As a woman, I was aghast at the recounting of sources in the Miss Universe organization sharing that Trump could override the judges’ opinions, winnowing finalists by rejecting dark-skinned contestants and those who “snubbed his advances.” I suppose none of us should be surprised, but I still found it shocking. What a prescient example for the MeToo movement. On Russia’s side, among the illuminating disclosures was the racially tinged disdain senior Russians felt for Barack Obama, all dutifully reported back to Washington in top-secret cables. Russian Roulette is best when describing how the country’s intelligence agencies were slow to recognize Russia’s effort and the frustration among Clinton’s supporters of the failure of the administration, the FBI and the media to trumpet it for what it was. One agonized aide is quoted as telling the authors, “We were wearing self-imposed handcuffs.” It doesn’t fill in many blanks, but it does document. For me, a distressing read.